What does Eventide’s “new method for processing audio” offer that we don’t already have in our plug-in folders? The idea of splitting up a source sound in order to apply separate processes to each element is not a new one. There are, for example, modular plug-ins that can simultaneously distort low frequencies and compress the mids while flanging the bejeezus out of the top end, and there are numerous ways to slice up drum loops and apply different effects to each beat. 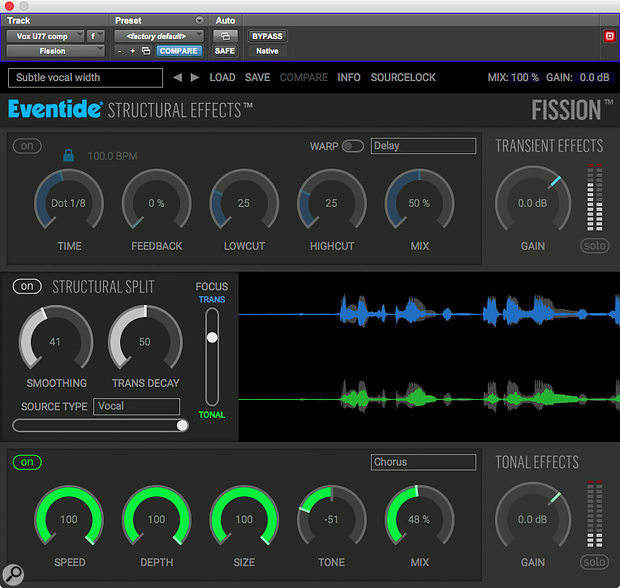 Eventide’s Fission takes a different approach: rather than dividing up the source signal using a simple frequency splitter or time-based chopper, it divides incoming audio into ‘transient’ and ‘tonal’ elements. You can then apply your choice of effect to one or both of these components of the source before they are recombined at the output. To create a Fission patch for a given source, you’d usually begin by optimising the splitting process to suit it. The first step is to choose one of 13 named algorithms from a list where options include ‘general’, various drum and percussion instruments, guitar, bass, piano/synth and vocals. The differences between these algorithms are more apparent on some sources than others, but the right (or wrong!) choice can make quite a difference on complex signals like the human voice. A Source Lock button nails down your selection so that the algorithm doesn’t change when a new preset is recalled. Once you’ve selected a splitting algorithm, you can fine-tune it using Smoothing and Trans Decay controls, which do pretty much what you’d expect them to. Trans Decay naturally makes the most difference on transient-rich sources such as drums, where short decay times see only the initial strike making it into the ‘transient’ path and longer decays can mean virtually the whole signal being treated as a transient. There’s also a Focus control, which is not quite so obvious. The idea seems to be that you can ‘weight’ the splitting algorithm in favour of having elements detected as transient or tonal material. At the top end of its travel, Focus pushes the entire signal into the ‘transient’ path, and as you slide it downwards, more and more of the source is split off into the ‘tonal’ path, until you reach the lowest setting where everything is routed that way. On paper, this doesn’t sound so very different from what you can do with some transient-shaping plug-ins. Indeed, readers with long memories might recall Eiosis’s interesting E2 Transienter, which allowed the attack and sustain portions of the signal to be completely separated and processed independently. Despite Eventide’s terminology, however, the way in which Fission splits up incoming audio is somewhat different. As encountered in Fission, ’transient’ is more of a catch-all term covering chaotic or noise-based elements of the input, while ’tonal’ means anything where the frequency content stays stable for more than a few cycles. So if, for example, you feed a vocal part into it, the ‘transient’ path contains most of the energy from fricatives and sibilants, along with quite a lot of artifacts in the high-frequency air band. The ‘tonal’ component, meanwhile, has a smooth, dulled top end, and can take on a watery quality not unlike a low bit-rate MP3 file. This is easy to hear for yourself, as each path has its own solo button, and what’s interesting is that although metallic ringing artifacts are often audible when either is soloed, the two recombine perfectly: as long as you aren’t actually applying any effects to either path, Fission’s output will completely null with the unprocessed signal if you flip the polarity. This makes sense of having the Focus control run from 100 percent ‘transient’ to the opposite extreme: you can park it at one end of its travel and treat Fission like a conventional effects processor, then automate it to slide all the way down to the other end, in effect morphing the signal from one effect to another. The controls in the Structural Split section can be used to create effects that are interesting in their own right. A particular favourite of mine, for instance, is the ‘Bowed Piano’ preset, which removes the attack portion of a keyboard sound to leave a very musical, short swell as each note is played. Naturally, though, the most fun is to be had by applying effects separately to the ‘transient’ and ‘tonal’ components of the split signal. You can choose one each from a list of six Transient Effects and seven Tonal Effects. Reverb, EQ, compression and delay are common to both, albeit with modified parameter sets to reflect the likely differences in what they’re processing. The tap delay and phaser are unique to the Transient Effects, as is the gate option in the EQ module, while only the Tonal Effects engine offers chorus, pitch-shifting and tremolo. Like most of Eventide’s plug-ins, Fission comes with a pretty thorough preset library, and as you try it out on different sources, what becomes clear is that there’s a lot of diversity on offer. Fission really isn’t one of those plug-ins that just offers a lot of minor variations on a single basic theme. On the one hand, it has its signature effects, weird and wonderful things that only Fission can do, and many of the ‘artist’ presets from big-name engineers explore these wilder shores. Take a drum loop, apply a tempo-sync’ed delay in the Transient Effects and a downward pitch-shifter in the Tonal Effects, and things get strange and unnatural pretty fast. The tremolo in the Tonal Effects is capable of some pretty extreme effects in its own right, including hard auto-panning and envelope modulation of depth and rate: team that with something like the phaser or tap delay in the Transient Effects and you have a recipe for true sonic mayhem. More unexpected, though, and perhaps more impressive, is Fission’s usefulness in less far-out roles. In many cases, the ability to divide the input signal into ‘transient’ and ‘tonal’ paths provides a very effective way of ‘improving’ effects that are already familiar. On a guitar or electric piano, for example, you can apply heavy tremolo only to the ‘tonal’ path; and the results sound just like normal tremolo, except that magically, all of the note attacks come through loud and clear. Alternatively, you can add weight and impact to your drum sounds through an EQ boost in the ‘transient’ path, without exaggerating any ringing in the snare and toms, or slather a vocal in ferociously bright reverb without exaggerating sibilance. By playing around with chorus or pitch-shift effects in the ‘tonal’ path, it’s possible to create some subtle but very effective widening and brightening effects that don’t fall foul of the usual problems with over-enthusiastic consonants jumping out of the mix at you. Ultimately, the only limits are your imagination, and the artifacts of the splitting process: although the ‘transient’ and ‘tonal’ paths recombine seamlessly if no effects are applied, any ringing or warbling that gets fed into a reverb or delay in one path won’t be ‘cancelled out’ and so remains audible at the output. Sometimes this adds to the character of the effect, but there are times when it means you can’t push things as far as you’d want to, or employ Fission effects on very exposed acoustic parts. The designers of any plug-in that spans such a lot of sonic territory have to strike a balance between making it as versatile as possible on the one hand, and making it easy to use on the other, and I think Eventide have judged this pretty well. Some of the individual processes, especially the reverb, are rather more basic than you’d expect of a plug-in dedicated wholly to the same effect, but never so much as to feel limiting. If you do want to go further than the built-in effects permit, you could always duplicate your source track and use the solo buttons in two instances of Fission to create dedicated ‘transient’ and ‘tonal’ channels within your mix. Although Fission bears a superficial similarity to plug-ins that have gone before, it’s actually a genuinely original concept that has no obvious equivalents I know of. Not everyone needs to warp drum loops or create psychotic clouds of pitch-shifted guitar, but its more restrained applications ensure that Fission has a role to play in more subdued contexts too. Unlike many novel effects, Fission has much more than mere novelty value! A genuinely original approach to multi-effects design, with a broad range of applications. Capable of subtle as well as extreme effects. Easy to use, with a good preset library. The artifacts of the splitting process limit its usefulness in some situations. 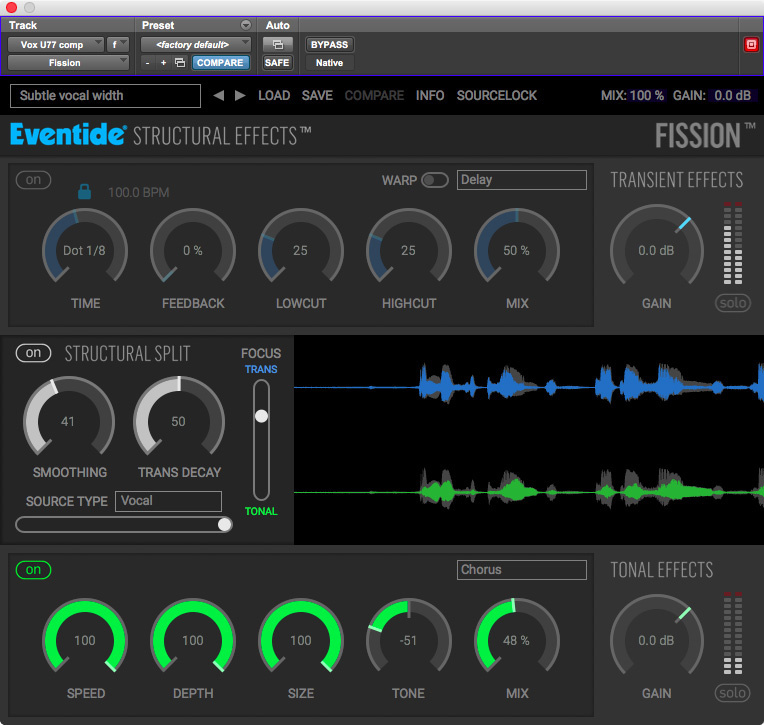 The idea behind Fission is a clever one, and Eventide have executed it very well, bringing a new slant to old effects and introducing some way-out new ones.